Economy is one of the most crucial aspects of management of a power system. We can have higher efficiency with specially designed equipment but the cost of such equipment is usually high. On the other hand, the lower-costing equipment will have corresponding limitations of efficiency and workability. A good engineer, therefore, must make use of the equipment available and strike a balance between optimum efficiency and optimum economy. 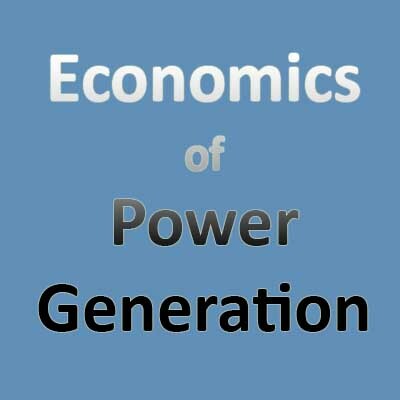 The study undertaken for this purpose is termed as ‘Economics of Power Generation’ and it is, by definition, chiefly concerned with the cost of production per unit (1 kWh) of electrical energy. For the engineer, it becomes necessary to understand various aspects of generation cost and the factors that affect this cost. 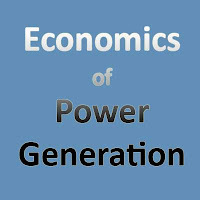 The total cost of power (electrical energy) generation comprises of the following charges: (i) Fixed cost, (ii) Semi-fixed cost, (iii) Running or operating cost. As the name implies, such cost remains constant. It is independent of the maximum demand, the plant capacity and the energy generated. All of these costs are fixed, and hence, fixed cost remains constant under all conditions. Such charges are independent of the energy (kWh) generated but depend upon the maximum demand.Higher the max demand, the greater the semi-fixed costs. Interest and depreciation on the capital costs (investment and insurance) on the land, the buildings (construction costs) and the costs of the equipment needed for generation, transmission and distribution of the electricity. The capital investment of the plant is huge and usually loaned. The interest of this loaned amount is considered in the cost of production. Such interest may range up to 8% depending upon the market conditions. The depreciation mentioned above relates to the reduction in value of the equipment that are used constantly. Due to wear and tear, the depreciation occurs and such depreciation costs are also included in the fixed and semi-fixed charges. Semi-fixed charges will also include the salaries of the management and other (clerical) staff, since these depend upon the size (and cost) of installation which again depends on the max demand. As the name implies, running charges will depend mainly upon the energy (in units or kWh) generated by the plant. Cost of fuel: This cost, of course, varies with the type of plant. It is lower in thermal (coal based) plants than nuclear plants. However, for hydroelectric plants (HPS), this cost is nil. Cost of maintenance and repairs: As a plant ages, wear and tear occur, and maintenance is needed. The wear and tear of the plant necessitate the use of lubricating oil which has its own cost. Salaries of the operating staff: The higher the size (capacity), the more the number of operating personnel required. Other Costs: These costs are not applicable for all plants and consist of charges for feed water (TPS), the water treatment costs (HPS and TPS) and enrichment of fuel costs (NPS). ....where, A = annual fixed cost, B = a constant which when divided by maximum demand (kW) gives annual semi-fixed cost, C = a constant which when multiplied by the annual kWh output gives annual running cost. However, sometimes, it is more convenient to include fixed costs (A) together with semi-fixed costs (B). This simplifies the tariff scheme. ....where, a = constant which when multiplied with max demand (kW) gives us the annual cost of the first part; b = constant which when multiplied by the energy output (kWh) gives the annual cost of the second part.